This entry was posted on Saturday, August 27th, 2011 at 00:23 and is filed under Election 2012, GOP Candidates, Politics, Tea Party. 24 Responses to Some of You Tea Party Folk Think Perry’s the Answer? Perry is only 'conservative' when convenient. While he's been an above average governor, he's not a movement conservative and not capable of cleaning up the mess after Obama. I worked for Perry: I pushed voter cards for him in Beaumont and Houston back in 1990. He's done a fair job at maintaining the status quo in Texas. He kept the growth of the number of state employees a little under population growth over 10 years. Meanwhile, he amassed powers in the office of governor never intended by the Texas founders. His record has nothing to suggest he'll reduce the size of government, cut costs, eliminate programs, or return power to the states and people. At the federal level, we can't afford the status quo in the size or power of government. We need somebody who will reliably cut government and devolve power back to where it belongs. Only one candidate/potential candidate has actually ever reduced the size of government. And who is the one candidate/potential candidate to whom you refer? I would also like to know who in the field of GOP candidates you think is more sympathetic to the tea party movevement? Actually, in fairness there were two governors who actually cut their state's budgets, reduced the state payroll, reduced state debt, and willingly ceded power back to the people and local authorities. As much as his position on social issues and foreign policy are unlikely to help him gain any traction, the fact is Gary Johnson dramatically reduced the size and power of government in New Mexico. Sarah Palin is who I was referring to as a governor who actually did in Alaska what we desperately need done in DC. Mark and I might disagree on Perry as governor, but it is precisely his big government by fiat approach which should alarm those in the Tea Party. Mark's analysis of the TTC in the article is spot on and provides insight into his real philosophy. Faced with an issue or challenge, Perry's knee-jerk reaction is another government program managed by his loyal army of appointees. FWIW, I remember Bill Clements as governor, Mark White, and then Bill Clements again, before Ma Richards. a movement that I am most against: more government, lax laws, and no responsibility, and I hereby offer my resignation to helping vocally & monitarily the Tea Party. Great post Mark! My family and I are Tea Party and we don't understand how some can see Perry as Tea Party material. My father and I always talk politics and we both see Perry as nothin more than a crony capitalist RINO. The border thing alone should be a big reason for Tea Party to not back him. Mark Davis had never liked Palin from what I remember and he's a bit off on Reagan. Reagan left the Democratic party because it started to become something he couldn't recognize. The party left him so he became a Republican and ran for president to serve the people. Perry was a Democrat and became a Republican because the tide was turning in Texas back then. He changed because if was good for his political career and it seems as though he serves himself the the donors that help him get elected. Excellent article Mark – I will share it on Tea Party FB pages and elsewhere too….including your comments just above to Steve. Since I've worked to school myself, plus read most all of your previous articles, I didn't learn much – yet love how well you lay things out. Thanks for such good stuff!! Mark. I know that you mean well and you have good intentions, but I am going to blast you pretty hard here for some good reasons. There are several parts that are wide open to critique but in the name of brevity I am going to stick to two basic points. First of all, name me a state that does not use eminent domain to build roads and highways. Second, that video you posted is a part of an orchestrated smear campaign that is a doctored edit job that is no different than the one that Alan Grayson in Florida used against his GOP opponent in 2010. Hmm that sorta changed everything. Look at what they left out. What Rick Perry said right AFTER those clips about the wall – He said that a wall isn't good enough and will give a false sense of security. Perry calls for an electronic frontier, predator drones, and he wants the military to do border enforcement and said that it can be good training for them. Fake "patriot" web sites and such are popping up all over hoping to dupe people with these fake videos and lies. Perry is on the record asking for this, demanding it repeatedly, and has kept every promise about increasing state spending for border enforcement. But there is only so much a governor can do. There is a real double standard when it comes to Perry on the border. Jan Brewer has whole sections of her border in AZ ceded to the cartels, but is she blamed for that?? Mark, you should have double checked that video first BEFORE posting it. When you see a high production video like that which is just so perfectly slick and targets TEA Party sensitivities so perfectly,. that should raise an alarm. Someone with a budget is making all sorts of highly edited and doctored Rick Perry videos and putting them out. So like I said Mark, I think that you are a good guy, but this election is serious business so the time for amateur mistakes like not fact checking something that is just "too scrumptious" are over. "First of all, name me a state that does not use eminent domain to build roads and highways. " I said as much in my own post. Read more closely. I also said that under the TTC plan, Perry intended to use "fair market value"(as decided by government) rather than "free market value"(as determined by free negotiations.) Do you understand the difference? I realize that from time to time, eminent domain is used. I don't think it's actually proper in most cases, but assuming it is, there should be no question that the properties involved ought to be purchased at free market value, and not at some value to be determined by the state and its cronies. Okay? I was not able to let your video be posted due to the constraints of the comment section. Feel free to come back and put a link up. I deleted it in editing the post without saving the link. Apologies. Having said that, the video does nothing to change my opinion. Rick Perry's actions, or rather, inactions on the border have been consistent until the last year or so as he sought re-election to governor, and presumably, prepared to run for higher office. Now, that said, do I believe people slap together misleading youtube videos? Sure. Do I believe that was the case here? No. The election is indeed a serious business, which is why I won't cede anything to those who shill for RINOs whether they have a drawl, or not. Amen, and amen. I have posted your article on my Facebook page for all my red-blooded, but very confused, Republican relatives. They try, they really do, but they don't get my staunch opposition to this guy. Rick Perry is a scary globalist … having said that, I would take him over Obama, though there isn't much difference in the end. Thank you for your timely response. Here is the video again. I know very well about how wordpress commenting works as my blog gets 40,000 hits a month. Mark, you have made my point, name me a state that does eminent domain using the criteria you have specified. It is a prescription for bias, p[laying favorites and for unequal treatment. The state has a set of rules and a process for eminent domain set in law by the legislature. Now when the state does not follow those rules in good faith, which does happen from time to time, then you have a case, to blast Perry as a "rino" for using the same process that pretty much every state uses is unfair. Ultimately this is small potatoes. Lets get to the video. While nothing in the more complete unchopped video I posted and you deleted changes your opinion, it does change the context and meaning of Perry's spoken thought dramatically. To go from "Perry is am open borders guy who opposes a fence" – to – Perry saying that a fence is not good enough and we need an electronic frontier, predator drones, and the military patrolling the border; are two radically different things and are about as different as different can be and any person with even a residue of honesty would have to admit that. Again, it doesn't fit the style sheet for my comment section. My comment column is too narrow and it will mess up the layout. Also, I'm glad to know you've been at this a while. I've been at it 41 days and have approximately 41000 page views, so gee, imagine that. No, you made my point. The fact that nearly every state does something doesn't mean it should be done, does it? That argument is worse than that of a twelve year old: "He did it TOO." No, you see, one piece of video doesn't tell the story. Rick Perry's record pre-2010 is pretty clear. When Texas legislators began to talk about a bill to mimic AZ's 1070, Perry quickly came out an d quashed it. Do you deny this? Yes or no? Part of your problem is that you're relying solely on what Perry has said since he first began entertaining a white house run, and when he saw a strong primary challenge for his office in 2010. You need to drop all the way back to the beginning. I am exercising extreme patience here. Don't test it. I haven't insulted you, and if you wish to have another comment posted, I'd ask you to refrain from the same. Just on the TTC portion, I think there is also a difference in the scope. TTC was going to take massive amounts of land. Frequently, the use of ED is to widen existing roads. Most people recognize there isn't a lot of options. The roads need to be widened and building an alternative route is cost-prohibitive and damages the corridor of businesses even more than widening. New interstates are relatively rare. One, which I use frequently, is the toll road 45/130 running from Buda to Georgetown to the east of Austin. Despite the disaster that is I-35 going through Austin, toll 45/130 is hardly used, it's almost a mile wide. It's great for me, but what about the land owners who lost existing road access, had their farmland divided, and I guarantee they received far less than real market value. An argument can be made Toll 45/130 was logical given Austin's growth (gee, what would cause Austin to grow so fast over the last 20 years? I wonder, government?) to create an alternative to I-35 through Travis County. What is the logic for parallel roads along I-10, I-45, and other interstates in the middle of nowhere? What is the logic for making an existing gas-tax paid for I-35 from Laredo to San Antonio a toll road? I-35 in South Texas is properly sized and well maintained. Sorry, that is just a gratuitous grab, unjustified, and at the expense of property owners and taxpayers for a boondoggle. You might be able to pick apart some details in the minutiae, but the over-arching reality is Perry is a big government guy. 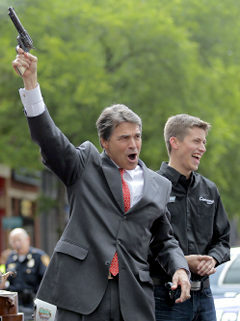 I maintain Perry's been an above average governor, just like 24 other sitting governors. He is not the right answer for what ails us in DC, because he's never reversed the encroachment of government, ceded powers, eliminated agencies, or cut the state payroll. I agree with Brian, but saying someone is an "above average governor," is not saying much at all about the person. It might even be an insult. Thanks for an excellent post. I've known of his rino-ism before and have been collecting info on him, to warn others. I've noticed too for all the ballyhoo about his great poll numbers that in the three weeks since he's announced he drops a couple of points. I think the public is getting wise to him. Fingers crossed. I think I'll link to this post if you don't mind? You may indeed! Thank you! I do not have the techno-smarts to post videos and links, but I will forward this article to my "Patriots4Liberty " readership group! Continue your fine work, sir.